I started working at the age of 16 in an attempt to make enough money to buy fast food and go to the movies. Ever since that young age I have had 10 female superiors in every job that I worked. Just twenty years ago, the field of journalism and media was dominated by white men with gray manes. In many ways that still rings true but the landscape is quickly changing. Three of my female superiors were entrepreneurs, two were high ranking producers at a major news network, three of them were women of color, and six of them had advance degrees. You might be wondering why I am telling you this. What does this have to do with anything? Well, the answer is simple: capitalism is reason for this change and it is also the reason I have to illustrate that women have taken a leap forward in a mainly male dominated industry. Capitalism can keep the gender binary and patriarchy in place or it can change it for the better. During WWII, women went into the workplace as capable and competent workers doing the jobs their husbands did during antebellum. Rosie the riveter became a symbol smashing through traditional gender roles in the 1940s. However, in the 1950s the nation seemed to have forgotten that. Instead of women workers dominating factories, they were placed back into the kitchen with shiny new appliances like the microwave and the dishwasher. Without knowing it at the time, corporations and American capitalism became a driven spark to the feminist movement of the 1960s. In just than two decades a paradigm shift occurred and it wasn’t because of overt sexism but because of dogmatic patriarchy and returning to the status quo. A husband works two jobs because he refuses to let his wife work but the house needs two incomes. As he works two full time jobs, he never gets to see his kids. While the wife is struck with the kids all the time and doing all of the housework, helping with homework, and being a single parent. She never gets to grow and pursue a career and the husband will have no impact on his offspring. While this happens corporations make money hand over foot at the expense of families. Some would think that traditional gender roles would be a fixture in our economic system but it does not have to be. If we look at the idea of the housewife /househusband stereotype, we can see that the idea of women and men that stay at home has changed because of capitalism. The reasons for this is simple. Through Capitalism we have fast food restaurants ready to provide entire meals for family. As time progress onward the menus will increasingly get more healthy as demanded by the consumer. When we shop in the grocery store frozen foods line freezers just waiting to be popped in the oven. There are also prepackaged salads and pre-cut fruits to fulfill our health needs. Just like that an instance meal is created thanks to capitalism. No one has to cook anything if we chose not to. Especially, stay at home parents. They are free to pursue an online degree, work from home or anything else while the kids are at school. When it comes to cleaning there have been inexpensive robotized maids in the form of roombas that has hit the market to sweep and mop your floors. Because of capitalism, daycares have taken the charge in rearing our children when schools can not. The machine that is capitalism will make every task we do a money making institution for better and for worse. In the case of gender roles, the tasks that were associated with men and women have been blurred. The home and the workplace are no longer prescribed to one or the other. At this time in history, we are at an impasse. We live in a new world where women are more educated than men, capable of leading corporations, and still managing their families if they choose to do so. 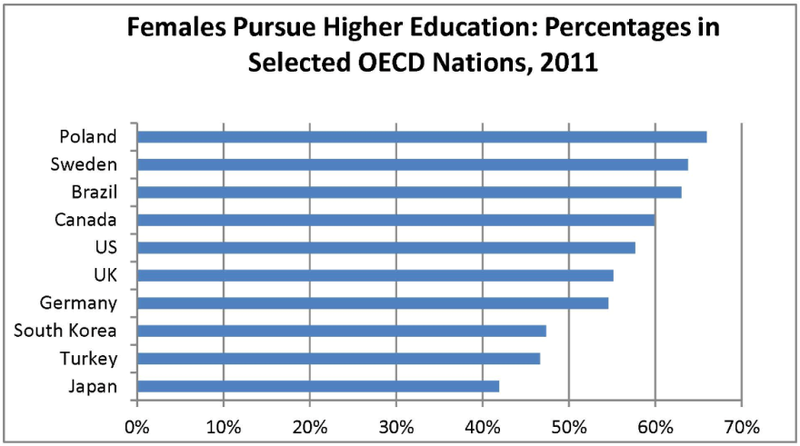 The table above shows the countries where women are pursuing higher education. This means that women are becoming highly qualified workers ready to be hired and sadly these numbers do not reflect job placement just yet. The major issue with capitalism and gender politics is that it takes a step forward in the right direction and then takes three steps back to old time patriarchy. Just last year Republicans blocked a bill that would make equal pay for women a mandate. Also last year, Hobby Lobby seem to have found a way to disregard the needs of its female workers. The reality is that “women have represented about 57 percent of enrollments at American colleges since at least 2000; they tend to have higher grades; men tend to drop out in disproportionate numbers; and female enrollment skews higher among older students, low-income students, and black and Hispanic students,” according to Alex Williams from the New York Times. Yet women can’t get a break. The question is how do women prosper in a backwards system. I think the adage of fighting fire with fire applies here. If a venue does not exist, create a new one. Owning your own business is the best way to guarantee equal treatment and fairness. If corporations fail to see your value, leave them, boycott them, and find corporations that will. The inevitable is already happening. If men failed to be educated well and fail to pursue higher education with the same vigor as women, companies will have no choice but to higher women to management positions because men won’t have the qualifications to get the job done. Eventually, things will change because that is the course of Capitalism. Maybe women are that change.